During a stock trading and investment unit, my economics class visited the Center for Trading and Analysis of Financial Instruments. 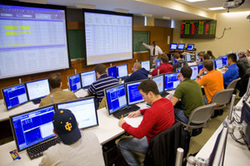 The students were able to access real-time information and make decisions regarding stocks and trading. I had numerous guest speakers to enhance my curriculum during a finance unit I brought in the local bank manager and a financial planner. During a entrepreneur unit, three local business owners, Cayuga Lake Creamery, High Point Farms, and Life So Sweet Chocolate, discussed the benefits and challenges of owning a business. This experience was beneficial in that it connected learning to the "real world" and it made economics come alive.